Anise (Pimpinella Anisum, Liun.) 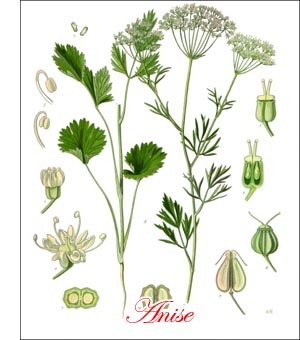 is an annual herb of the natural order Umbelliferae. It is a native of southwestern Asia, northern Africa and south-eastern Europe, whence it has been introduced by man throughout the Mediterranean region, into Germany, and to some extent into other temperate regions of both hemispheres, but seems not to be known anywhere in the wild state or as an escape from gardens. To judge from its mention in the Scriptures (Matthew xxiii, 23) it was highly valued as a cultivated crop prior to our era, not only in Palestine, but elsewhere in the East. Many Greek and Roman authors, especially Dioscorides, Theophrastus, Pliny and Paladius, wrote more or less fully of its cultivation and uses. From their days to the present it seems to have enjoyed general popularity. In the ninth century, Charlemagne commanded that it be grown upon the imperial farms; in the thirteenth, Albertus Magnus speaks highly of it; and since then many agricultural writers have devoted attention to it. But though it has been cultivated for at least two thousand years and is now extensively grown in Malta, Spain, southern France, Russia, Germany and India, which mainly supply the market, it seems not to have developed any improved varieties. Its roots are white, spindle-shaped and rather fibrous; its stems about 18 inches tall, branchy, erect, slender, cylindrical; its root leaves lobed somewhat like those of celery; its stem leaves more and more finely cut toward the upper part of the stem, near the top of which they resemble fennel leaves in their finely divided segments; its flowers yellowish white, small, rather large, in loose umbels consisting of many umbellets; its fruits ("seeds") greenish-gray, small, ovoid or oblong in outline, longitudinally furrowed and ridged on the convex side, very aromatic, sweetish and pleasantly piquant. The seeds, which should be as fresh as possible, never more than two years old, should be sown in permanent quarters as soon as the weather becomes settled in early spring. They should be planted 1/2 inch deep, about 2 inch asunder, in drills 15 or 18 inches apart, and the plants thinned when about 2 inches tall to stand 6 inches asunder. An ounce of seed should plant about 150 feet of drill. The plants, which do not transplant readily, thrive best in well-drained, light, rich, rather dry, loamy soils well exposed to the sun. A light application of well-rotted manure, careful preparation of the ground, clean and frequent cultivation, are the only requisites in the management of this crop. In about four months from the sowing of the seed, and in about one month from the appearance of the flowers, the plants may be pulled, or preferably cut, for drying. The climate and the soils in the warmer parts of the northern states appear to be favorable to the commercial cultivation of anise, which it seems should prove a profitable crop under proper management. The leaves are frequently employed as a garnish, for flavoring salads, and to a small extent as potherbs. Far more general, however, is the use of the seeds, which enter as a flavoring into various condiments, especially curry powders, many kinds of cake, pastry, and confectionery and into some kinds of cheese and bread. Anise oil is extensively employed for flavoring many beverages both alcoholic and non-spirituous and for disguising the unpleasant flavors of various drugs. The seeds are also ground and compounded with other fragrant materials for making sachet powders, and the oil mixed with other fluids for liquid perfumes. Various similar anise combinations are largely used in perfuming soaps, pomatums and other toilet articles. The very volatile, nearly colorless oil is usually obtained by distillation with water, about 50 pounds of seed being required to produce one pound of oil. At Erfurt, Germany, where much of the commercial oil is made, the hay and the seeds are both used for distilling.